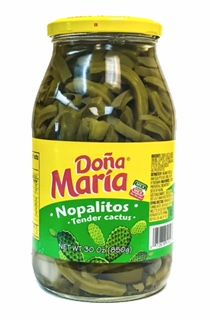 Nopalitos - Tender Cactus by Dona Maria 30 oz. Sliced Prickly Dona Maria Nopalitos Pear cactus shoots, cooked. Sliced Cactus Pads. Nopalitos - Cactus, or Nopal, is a typical sight in the Mexican landscape. It is not strange that it should find its way into the local cuisine. The use of Nopalitos has its origins in the Roman Catholic observance of serving meatless dishes during Lent; now they are a part of everyday cooking. The paddle, or tender pads, of the plant (called prickly pear in the U.S.) are eaten as a green vegetable in Mexico. The best young shoots are packed fresh, pickled or preserved. Sliced for convenience, their use lends itself to a variety of dishes, such as traditional nopalitos salad or soup. Combined with seafood, omelets, quiches, and casseroles, nopalitos adds a delicious and authentic flair. It is believed that one of nopalitos (nopal cactus) properties is a natural diabetes and cholesterol medication, and its also used in the treatment of obesity, gastrointestinal disorders, skin ailments, and viral infections. Combine nopalitos, tomato wedges, avocado and jicama in a medium serving dish. Combine oil, lime juice, sugar, cumin and salt. Pour over nopalito mixture and mix well. Garnish with fresh cilantro. Chill and serve. Serves 6. Nopalitos Dona Maria, rebanadas de nopales en agua con sal. 1/4 vaso de Mole Do�a Mar�a de 8.25 0z. 1/2 frasco de nopalitos Dona Maria de 15 oz. - Fr�a el Mole Do�a Mar�a y diluya con el caldo de pollo y reserve. - Coloque en el plato una cucharada de mole, los nopales y la carne por encima. - Acompa�e si lo desea con arroz y rebanadas de aguacate. After hearing how good these are for you we are putting them in everything we eat now. Amazing taste!